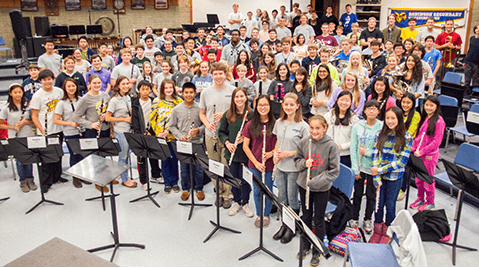 As we look forward to the 2019-2020 school year, we’d like to share some news about the coming Northern Virginia Youth Winds season. Auditions have been posted and are scheduled for the last two weeks of May. For next year, we are instituting a change in policies for returning students. All current members of an NVYW ensemble will automatically be accepted into the organization next concert season without audition. Seating placement auditions will occur in the fall with all new and returning members. We are also pleased to announce a tuition decrease for next year. Tuition for the 2019-2020 season will be $275. We hope this, along with the “no auditions for returning members” policy will help you and your students make the decision to return to NVYW next year. It will be an exciting year for CFBA as the City of Fairfax Band celebrates its 50th anniversary.season, and we hope to share the excitement with our student members. We will be bringing in guest soloists, conductors and clinicians to work with the students throughout the year. We invite you to find out about auditions and policies for returning students. There is no commitment on your student’s part to return until we start collecting tuition payments this summer. But if your student is considering returning, we ask you to sign them up so we know how many open seats we need to fill as we head into auditions. We know you and your students have many choices available for extra-curricular musical activities, and we hope as you consider those choices that you come back to NVYW. Find out more about our audition policy and sign up here!